Emission-compliant, biodiesel-approved engines provide muscle to handle heavy loads, wet conditions and hillsides without slowdown. 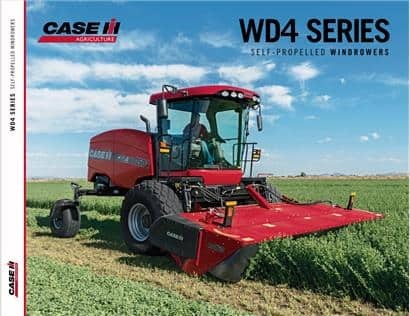 The WD4 series windrowers offer engines with Case IH Efficient Power technology. Windrower field tests have demonstrated a minimum of 10 percent operating cost advantage compared to similar Tier 3 windrowers. The 4-cylinder WD1504 and 6-cylinder WD2104 and WD2504 deliver 150, 210 and 250 horsepower, respectively. The windrowers are equipped with our patented Selective Catalytic Reduction (SCR) - only exhaust aftertreatment technology to meet Tier 4 B/Final emissions requirements. Because it does its work outside the engine, in the exhaust system, the engine can be tuned to operate at its peak power and fuel efficiency. WD4 windrowers also boast road speeds of up to 24 mph, so you can be more efficient and get another field cut before calling it a day. The hydraulic steering system reduces the number of mechanical linkages required, creating tighter and more responsive steering. The system makes the machine easier to steer, especially at high road speeds. These steering system updates have also improved drivability in the field. WD4 windrowers better follow the AB line when AFS AccuGuide™ autoguidance is activated. Case IH engineers adjusted the machine’s weight balance and developed caster wheels, set at a 3-degree angle. The dual-circuit hydraulic system with two 40-gallon-per-minute (gpm) pumps results in faster cutting speeds while maintaining a clean-cut and well-formed windrows. The hydraulic system also runs cooler and more efficiently, maximizing machine performance in draper applications. 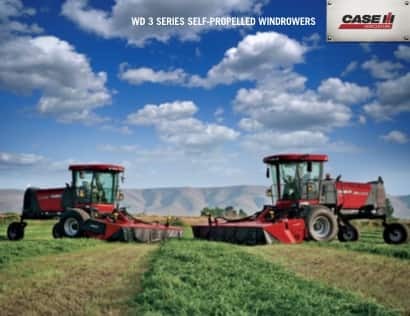 Case IH windrowers use the integrated AFS Pro 700 control center to not only manage windrower autoguidance functions, but also to control key machine functions and monitor windrower performance. Case IH windrowers utilize the AFS Pro 700 display. The AFS Pro 700 monitor is utilized on several other Case IH equipment offerings, making the displays tranferable to other eqiupment for ease of use. Operational information is displayed on the right. Coupled with the after-market GPS package, the left side of the display can show GPS information. All machine functions and operation information is available in one display. Optional rear camera kit can be added and run through the AFS Pro 700 display. Offers an optional LED forward and rear facing work and stubble lighting package for optimal night time visibility. The 4-cylinder, Tier 4 B/Final compliant WD1504 delivers 150 horsepower to provide the power and efficiency you need. The 6-cylinder, Tier 4 B/Final compliant WD2104 delivers 210 horsepower providing you the power you need to muscle through tough spots. The 6-cylinder, Tier 4 B/Final compliant WD2504 delivers 250 horsepower providing maximum performance to handle heavy crops, wet conditions and hillsides with ease. 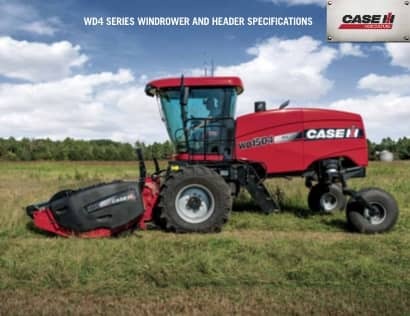 Configure and price your new windrower. Customize it the way you want.